Sign up for free and just shop with Vodafone SIMO Contracts as normal. Our average member earns over £300 cashback a year. Cashback is available on new Phone and Sim Only contracts for New Vodafone Customers only. Vodafone is not paying cashback on Basics SIMO plans. Vodafone SIMO Contracts cashback can be earned simply by clicking through to the merchant and shopping as normal. Vodafone SIMO Contracts Cashback is available through TopCashback on genuine, tracked transactions completed immediately and wholly online. Transactions may track at a lower amount but will uplift to the correct amount once confirmed. Get your hands on the latest smartphone on a pay monthly plan or grab a SIM only deal and save yourself some money by earning cashback through us. They offer 4G as standard with pay monthly bundles, while they also provide a Network Satisfaction Guarantee. Search the latest devices and compare plans, while you can also check the network coverage for your area. Browse the latest offers and take advantage of Vodafone discounts, or view nearly new and clearance phone deals from Vodafone Outlet, while you can also buy iPad and Android tablets, mobile broadband, data dongles and a great range of accessories. Download their app, meanwhile, and you can manage your account wherever you are. You can take advantage of our Vodafone deals to save money on the latest and greatest mobile phones. Whether you are thinking about a Samsung Galaxy S7, Apple iPhone 7 Plus or Sony Xperia XZ, you will be able to compare the most popular devices, choose your phone, texts and data and build your ideal pay monthly package. You will discover a wide selection of 24-month plans, which you can filter by monthly cost or data allowance. Whether you only need 250MB of data or could make use of 60GB worth of mobile Internet, they offer bundles which will give you anywhere from 250 to unlimited minutes. No matter if you are thinking about taking out a SIM contract, getting a new phone or selecting a broadband package, be sure to get money off Vodafone deals by shopping through one of our cashback offers. Remember If you don’t see the right cashback deal on this page be sure to check our other Vodafone offers pages to make certain you don’t miss out a chance to save. If you’re looking to pick up savings on all things mobile, then select the category from the menu on the Vodafone site, and head on over to the deals and offers section. Here you will discover a selection of the latest promotions on a variety of devices; pick up savings with offers like more data for less, up to 50% off pay as you go phones, or freebie offers such as added NowTV or Skysports Mobile. Those who have an old phone that they no longer need have an extra way to save. Trade in your old device using the online evaluation tool and Vodafone will debit you the cash straight to your bank, and they’ll even send you the packaging to post it for free. Don’t forget, anyone who already is a mobile customer can pick up additional plans for their family at a discounted rate of 15%; plus, if you’re a student there’s 10% off too. You can enjoy the best of entertainment with Vodafone thanks to fact that when you buy selected bundles, you can choose a NOW TV Entertainment Pass, Spotify Premium or Sky Sports Mobile TV. Vodafone is also the only network which guarantees your satisfaction, so if you are not happy with the service they provide you with, you should contact them. Purchase one of their pay monthly bundles and you can benefit from their fast and reliable 4G network as standard, so you can do what you like on your mobile phone more quickly. What's more, if you phone needs to be fixed, they will lend you one with all your contacts on to use in the meantime, while you can use your device as you do at home when abroad thanks to their roaming options. If you already have a phone that you love, then one of their Vodafone SIM only deals could be perfect for you as you can save money on your data, calls and texts by choosing the plan which suits your needs. Whether you want unlimited minutes or texts, or 4G data, all of their pay monthly SIM only plans feature Vodafone Global Roaming, which allows you to take your home plan to 100 worldwide destinations. Benefit from a flexible upgrade on a 12-month pay monthly plan and get a new one after three months or choose one of their Vodafone pay as you go deals for a SIM which offers even more flexibility. Download the free My Vodafone app from Google Play or the App Store and you can manage your account from the palm of your hand on your Android or iOS device. Its key features allow you to check your usage and manage your extras, meaning you can keep tabs on the minutes and data you have used. When it comes to billing, it offers you the chance to keep track of your spending as you can compare your most recent bill to previous statements, while you can use the Network Satisfaction feature to share issues or feedback and receive 250MB of free data. You can also view in-app FAQs if you have a question, or speak to their advisers on live chat. Whatever you buy using our Vodafone promo codes, your order can be sent to the address registered to your account by standard or premium delivery via Royal Mail or DPD. 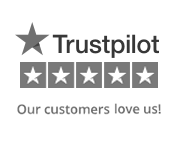 With standard delivery, you can expect your purchase within 2-4 working days, while if you choose the premium service, it will arrive the next working day if you order before 4pm. Once your order has been dispatched, the carrier will send confirmation of a delivery date by text or email, while if your item is being delivered by DPD, they will also provide you with a one-hour time slot. You can track the progress of your order thanks to their online order tracker by entering your order number and postcode. Alternatively, you can order online and have it sent to a Vodafone store for collection. If your device is in stock, you will be able to collect it within 30 minutes of receiving the confirmation email. If it is not in stock, it will take 2-4 days to be delivered from the warehouse. When you collect your item, you will need to take a valid debit or credit card, registered in the same name and address as your Vodafone account, a form of photo ID and proof of your current address, such as a utility bill from the previous three months. Vodafone Red+ is available to pay monthly customers who bought a Red or Red Value bundle between May 6, 2016 and April 11, 2017. It lets a ‘Leader’ share their data allowance with up to nine people of devices - known as the Red+ Group. The Leader can set individual data limits and manage the allowances of all the ‘Sharers’ in the group. All new Vodafone pay monthly and pay as you go handsets are locked to the network. To unlock a Vodafone device to use on another network, you will need to request a network unlock code (NUC). This is free if you are a personal customer and all you will need to do is complete an online form. Some devices cannot be used for tethering or as personal hotspots and you should check Vodafone’s device guides to see if yours can. To tether your device, or use it as a personal hotspot, you will need a good 4G or 3G data signal. Vodafone’s coverage checker will show you what the signal strength is in your area. How Much Is Vodafone Broadband? The cost of Vodafone broadband depends on the package. Unlimited Standard Broadband 17 will cost you a monthly all-in-one price of £25 (including £19 line rental), while there is a one-off fee of £24 for existing customers or £49 for new customers. Choose Unlimited Fibre 38 (up to 38Mbps) and you will pay £25 a month, while Unlimited Fibre 76 (up to 76Mbps) will cost £30 a month. There are no one-off fees with these. Vodafone are one of the world’s leading mobile communications providers, operating in 26 countries and in partnership with networks in more than 55 others. Throughout the world, they have almost 444 million customers, 19.5 million of which are in the UK. 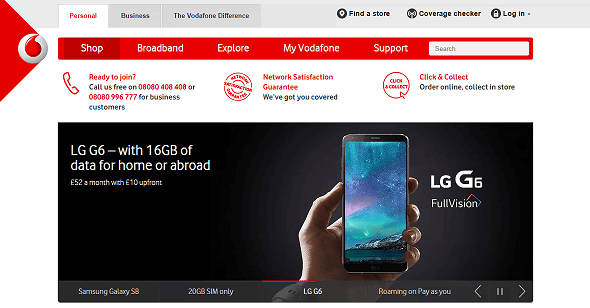 Vodafone know it is tempting to upgrade early, especially when a new handset comes out, which is why all of their new pay monthly plans give you the chance to make use of Flexi-upgrade and get a new phone from six months into your contract. You can upgrade your package and choose from their latest phones and plans or keep your phone and switch to SIM only. Keep in touch while on the move and get great deals on mobile phones, SIMs, mobile broadband and 4G at Vodafone. Browse a great range of handsets and tariffs, whether you are shopping for pay monthly, SIM only or pay as you go. You can also browse iPads and tablets, mobile Wi-Fi and dongles. Check 3G and 4G signal coverage and keep your existing number. 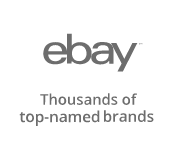 Buy and earn cashback rewards with these fantastic offers.